On July 6, 2018 U.S. District Court Judge Saundra Brown Armstrong rejected an appeal by the Martha Co. to force the County of Marin to reverse its denial of a tentative map and development plan for the project. These 100- or-so scenic acres will determine if Marin has enormous philanthropic pull — or not. I think that ultimately it will not be developed; rather, it will be the highest-priced open space that has ever been acquired in California. Tiburon voters will have a clear choice when they go to the polls Nov. 3 to elect three council members. Residents who like the way the town is being run will have the current mayor and three sitting planning commissioners to choose from. Those who would like a change have a political newcomer who wants to shake things up at Town Hall. Marin County has an abundance of many things: hiking trails, water views and great farm-to- table food. But try buying a vacant lot here and you’ll discover what we lack most. Simply put: We have no lots. We have no lots. There are few places with as little buildable “raw land” as Marin. This past December, for example, there were 641 homes for sale, but only 128 lots. And even that number is misleading because it assumes that all of the lots are viable, which they are not. “These lots tend to be very challenged,” says Ted Strodder, a realtor with Decker Bullock Sotheby’s. 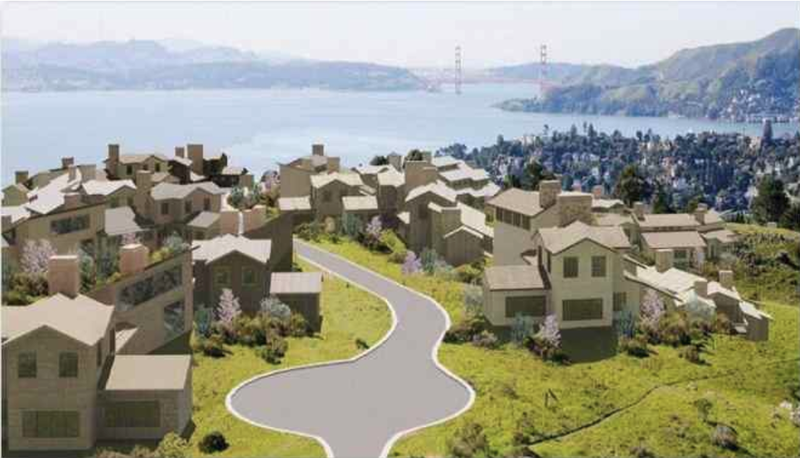 As a student at Dominican University, I feel that the proposal to build the foundation on the Martha Co. property in Tiburon proves once more that the environment we try to protect does not fully occur. How is it that with the Endangered Species Act in place, the Martha Co. property may still be allowed build on a land habitat to the endangered California red-legged frog? Sure there are implementations in place to reduce the amount of frog deaths from construction, but are we to just sit back and watch this species reduce even more in population. Why must we overlook this small organism that we deem unworthy of saving? Are we that ignorant to believe that the dollar amount is more important than saving the life of the frog? Tiburon Peninsula extends approximately four miles in a southeasterly direction from its connection to the Marin “mainland” at Highway 101. Along the spine, or ridge, of the peninsula are a number of lands, including Ring Mountain Open Space Preserve, that have escaped development, generally after persistent and lengthy battles. Tiburon is an incorporated town in Marin County, California. It is located on the Tiburon Peninsula, which reaches south into the San Francisco Bay. The smaller city of Belvedere (formerly a separate island) occupies the south-west part of the peninsula and is contiguous with Tiburon. Tiburon is bordered by Corte Madera to the north and Mill Valley to the west, but is otherwise mostly surrounded by the Bay. Besides Belvedere and Tiburon, much of the peninsula is unincorporated, including portions of the north side and the communities of Strawberry and Paradise Cay.